" The material Universe is purely made out of Aether "
Aether, from the Greek mythology, and according to Hesiod, Aiqhr, which was pronounced "ai-t-hair", was the son of Erebos (darker place in Underworld) and Nyx (the Night). He was the personification of the clear upper air breathed by the Olympus Gods and Goddesses. This site does not explain how aether works. Any medium capable of transmitting longitudinal waves could do the job. In order to keep things simple, one should postulate that aether is perfectly homogeneous, and that it can preserve energy without any loss. Then it would transmit sinusoidal waves whose speed c is constant. It is the speed of light, but also that of matter waves and all forces transmitted by aether waves. The aether, as a lossless medium, should also allow the existence of electrons as spherical standing wave systems, which can vibrate eternally. Such systems constantly radiate spherical waves and need energy replenishment. This is why aether must also have been completely filled with energetic waves since its very beginning in order to perform the electrons' amplification. You are not entitled to think that aether does not exist. You must admit that you are unable to fully explain any physical phenomena. You cannot explain the true nature of particles such as electrons, protons or neutrons. You cannot explain the so-called photon. You cannot explain how magnetic and electrostatic fields really work. Up to now, Descartes' explanation about light remains the only one which is acceptable. Light behaves as a wave and needs an aether. Light does not behave like particles as far as its quantum properties are attributed to electrons. You cannot explain how gravity works, either. So, unless you furnish an acceptable explanation, you must admit that you are dealing with the unknown, and that forces such as gravity or light could work using waves. If you think that gravity is "bending space", then you must explain how and why gravity is capable of such a wonder. Actually, you cannot, because Einstein's explanation for gravity was simply absurd. This great scientist postulated that light as a wave should be carried by a medium, which he called "éther". 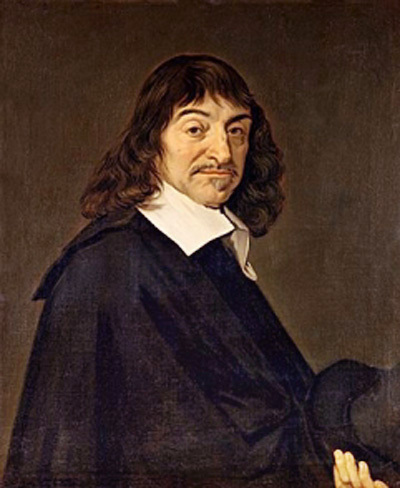 Descartes was French, and in French the é with the funny accent, which is actually a second letter, replace the "ai" from aither. So I strongly suggest that it should be written aether in English, not ether, in order to be respectful to Descartes. In addition, this should avoid confusion with ether gas or liquid. This web site shows that aether exists. Photons do not exist. So Descartes was right: light is made of waves. His pupil Christiaan Huygens described aether as "subtle air spheres in contact" in order to explain the way such waves could be transmitted. Augustin Fresnel thought that light waves should vibrate transversally according to his observations on Iceland Spath polarization. So he supposed that aether should be made of material points separated by intervals. However, such transverse vibrations do not really occur. Light is made of regular longitudinal waves and the phases only vibrate transversally. Light waves are composite in nature so they can carry transverse phase patterns. The material points idea definitely remains the best one, though. Such a structure is the simplest possible and it nevertheless explains two important phenomena. Firstly, material points becoming more and more distant can explain the Universe expansion. In such a case, very fast and distant galaxies would still be at rest with respect to the aether points over there. Secondly, our analysis of wave behavior through such points (we prefer "granules" because a point cannot exist) indicates that some anomalies should occur. For example, the wave speed slows down if the wavelength is very short. Just a few granules for a whole wavelength introduces a "quantum" effect. The program below shows that Mr. Anselme Dewavrin's algorithm, which is derived from Euler's method, does not yield exactly the same results as the accurate y = sin(2 * pi * x / lambda) procedure, especially when the discrete steps are insufficient as compared to the wavelength. It turns out that the so-called error in Euler's method is actually a true fact; but one must postulate that aether is really made out of granules, which transmits energy by discrete steps. Another example is the always positive medium, which cannot produce perfectly symmetrical sine waves for very high amplitude levels. The high amplitude (high compression) level is unlimited while the lower amplitude reaches a limit, which is the absence of granules inside a given space. I am quite sure that this anomaly explains very well the electron amplification because standing waves produce such an asymmetry, especially strong ones. So granules whose unique property is to repel one another are the perfect medium for aether waves. A similar model with both attractive and repulsive properties allowed Mr. Delmotte (see the Virtual Aether below) to elaborate a fantastic computerized medium. He was followed by Mr. Marcotte, who invented a different algorithm. Clearly, waves exhibit oscillations much similar to those of a pendulum. Galileo discovered that such oscillations are synchronous, and this explains why the wave speed remains constant whatever the frequency or amplitude. In November 2005, I simplified Mr. Delmotte's algorithm and applied it to the pendulum. The goal was to show that it should respect Hooke's law "Ut tensio sic vis", which means that the force exerted by a coiled spring, for example, is directly proportional to its extension. Mr. Philippe Delmotte invented the Virtual Aether in June 2005. His starting point was the Verlet algorithm, but he added Newton's laws for inertia and energy. This algorithm can produce some sort of "heat", a local vibration of granules. Mr. Jocelyn Marcotte invented his own algorithm, which is totally different, in January 2006. The procedure is also quite simple. It does not produce heat. Mr. Philippe Delmotte is working on an English version of his program, which I will put on this site to download. However, you can make virtual "ripples on a pond" right now using my own version of his model. It's fantastic! I dare say that this virtual medium is promised to a fantastic future. Because waves are important, the program will be progressively upgraded and it will be a must for all students in the world. I could already check a lot of wave phenomena, especially in a moving frame of reference: this greatly helps for studying Relativity. For instance, Lorentz predicted well before Einstein that Michelson's interferometer could not reveal the aether wind because it should contract. The point is that the 45° transparent mirror or the beam splitter should also undergo a contraction, making the reflecting surface angle different. According to standard rules in optics, the beam would not be reflected to a 90° angle any more. Many scientists argued that the interferometer contraction was impossible. Poincaré especially spoke about an "ad hoc" explanation without any valid reason and finally, Lorentz's hypothesis was ruled out. It was a huge mistake. Lorentz's contraction really occurs in such a way that any observer moving along with a wave system can no longer detect its motion. All seems to happen as if he was at rest. This is Relativity. In October 2007, I made several DivX-MPEG-4 videos. They show clearly that the mirror must be tilted to an additional angle in order to reflect the light beam to the correct 90° angle. I made one for all axes and directions, and also with the incorrect 45° angle. It turns out that the new angle is consistent with Lorenz's contraction g factor. So the interferometer must contract: there is no other logical explanation. Lorentz was right. It is that simple. In addition, matter contraction is now easily foreseeable because we know that matter is made of waves, and that all wave phenomena are submitted to the Lorentz transformations. As far as I know, the light beam behavior inside the moving apparatus has never been displayed. I am of an opinion that this experience is even more important than Michelson's. Thanks to Mr. Philippe Delmotte's Virtual Aether, it is now possible. Many scientists don't even know that the light beam waves must be tilted to the theta angle = arc sin (v / c) in order to propagate transversally. Moreover, the light beam itself and Fresnel's diffraction pattern undergo the on-axis contraction. I also made more videos showing how the Doppler effect transforms most common wave phenomena. I used the Lorentz transformations (see Oct. 15 below), which produce a slower frequency, hence no transverse wavelength contraction. Believe me, this is even more important than Michelson's results in order to explain Relativity. The Virtual Aether is a true laboratory where a lot of decisive experiences can be conducted. Now we know what is going on. No more absurd explanations. Just facts. Surprisingly, Newton's laws involving energy and inertia produce the same results as Euler's method, which is purely mathematical. Because Mr. Delmottes virtual medium can use both of them without any difference, and because Mr. Jocelyn Marcotte's algorithm also produces exactly the same anomaly, it turns out that the results are highly reliable. Euler's method is an approximation: it introduces some degree of error which is greater when the step is important as compared to the wavelength. The program above shows that the shorter the wavelength, the more unstable the curve. Actually, this so-called error appears to be a true fact: genuine waves really behave like that. Each aether granule transmits energy step by step. This discrete procedure introduces quantum properties. On the one hand, the result is a slower wave if the wavelength is rather small with respect to the number of granules involved. On the other hand, standing waves produce a local granule concentration, where the wave speed is greater. Then all aether waves crossing such concentrated areas must undergo a lens effect. This anomaly fully explains why the electron frequency reaches a limit. It is the highest possible, and finally all electrons oscillate on the same very high frequency. It also explains the lens effect inside its standing wave nodes and antinodes, hence its amplification by constant surrounding aether waves incoming from all directions. On the Internet since September 2002. Last update November 1st., 2007.